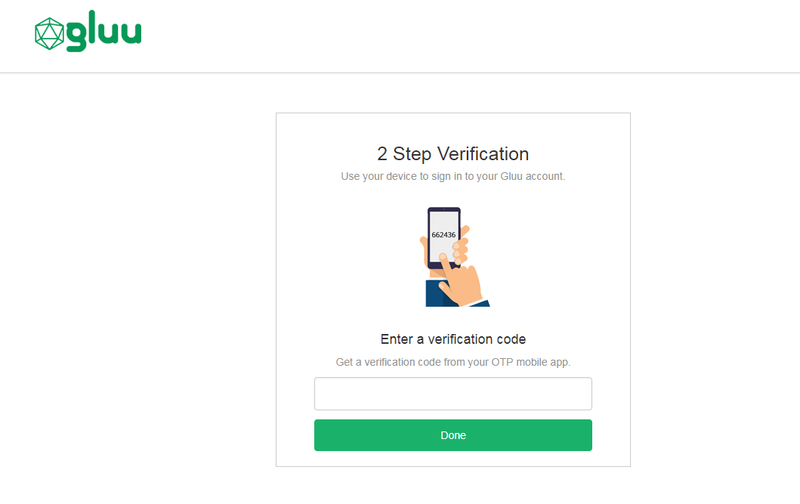 This document explains how to use the Gluu Server's included OTP interception script to implement a two-step, two-factor authentication (2FA) process with username / password as the first step, and any OTP app as the second step. The OTP interception script uses the two-factor event/counter-based HOTP algorithm RFC4226 and the time-based TOTP algorithm RFC6238. To support SMS OTP, follow the SMS OTP documentation. Now OTP is an available authentication mechanism for your Gluu Server. This means that, using OpenID Connect acr_values, applications can now request OTP authentication for users. If OTP should be the default authentication mechanism for all access, change both fields to OTP. A login page that is displayed for all subsequent OTP authentications. OTP device enrollment happens during the first authentication attempt. The initial enrollment page displays a QR code that needs to be scanned with the OTP app. All subsequent authentications will require the user to retreive and enter an OTP from the application. A user's OTP device(s) can be removed by a Gluu administrator either via the oxTrust UI in Users > Manage People, or in LDAP under the user entry. In LDAP, navigate to appliances and search for an attribute oxExternalUid. Remove the values of this attribute. Upon the next OTP login attempt, the user will be prompted to enroll a new device. OTP custom script works in one of two modes: TOTP (time-based) or HOTP (even-based). When using time-based flavor of OTP, mobile applications generate codes based on the current time of the device, this code is validated by the server using its own time. As consequene, significant time lags can provoke authentication failures. It's out of admins control have users devices in a consistent time, but they can maintain server system time accurately. For this you can follow any of the different approaches for linux time synchronization over the network, the most common being ntp. To offer end-users a portal where they can manage their own account security preferences, including two-factor authentication credentials like OTP apps, check out our new app, Gluu Casa.